Irton High Cross, Eskdale, Cumbria. OS Grid Reference: NY 09156 00471. In Irton churchyard (south-side of St Paul’s Church) in Eskdale, Cumbria, stands the tall, slender Irton High Cross, a Viking monument thought to date from the mid 10th century AD, though a few scholars suggested that it is even earlier than that? 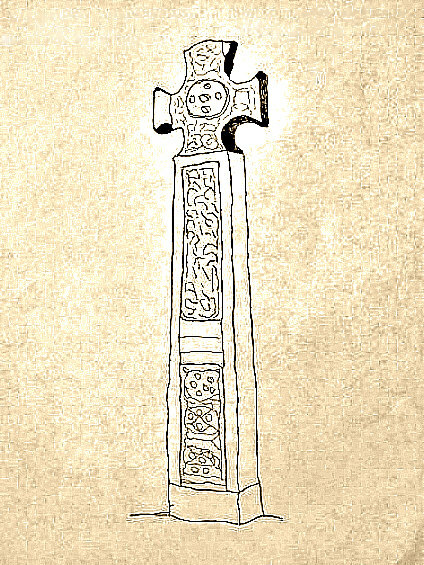 The cross has some very intricate decoration – some of which looks to be more Celtic than Danish. Its runic inscription having all but faded away, but other than that it is a very fine ancient monument; the cross-head, in particular, being very pleasing to the eye. St Paul’s church itself dates from the Victorian period. To reach this site from Santon (Santon Bridge) follow the lane for a couple of miles south, then southwest towards Holmrook, but turning off to the right before reaching that village and, just after passing the entrance to Aikbank farm. Follow this track (north) to St Paul’s Church and the Irton Cross. The tiny village of Irton is roughly ½ a mile to the east of St Paul’s Church and 3 miles southeast of Gosforth. The Irton High Cross is a well-preserved, intact, cross standing at almost 10 foot high (3.4 metres) and is made of red sandstone. It is a slender cross that tapers away slightly towards the top where there is a very fine, carved cross-head with central raised bosses. The age of the cross is uncertain, but most scholars think it to be from 950 AD. However, a few scholars and historians have suggested that it looks to be of an earlier date maybe the 8th or 9th century? And some of the carved decoration on its four-sides looks to be similar to Celtic work, rather than Anglian/Danish; Cumbria obviously being close to the Celtic countries of Ireland and Scotland. There is also a Saxon influence. We can see some very intricate interlacing and circular designs with dots (pellets) in long panels on the shaft, and also on the cross-head; the central bosses also having this pellet-work. Two figures are apparently visible as are beasts. Other carvings include: key-patternwork, diamond shapes, scrollwork, spirals and roll-moulding. Originally there was a Runic inscription in the smaller panel but this has now worn away. The sandstone base is perhaps the same age as the cross or later? 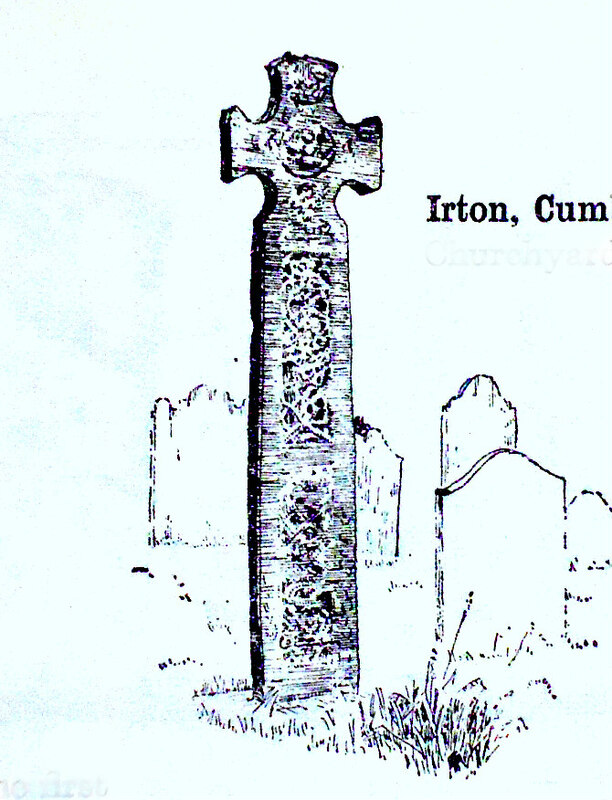 Arthur Mee (1961) tells us that: “Not so old as some flints and spear-heads found here, the remarkable churchyard cross of Irton is old enough, for it was probably carved out of the red sandstone 1000 years ago; and for its beauty and preservation it ranks second only to the wonderful cross at Gosforth. Tapering gracefully to a fine head, it is ten feet high, and is richly ornamented. Beyond the fine timber lychgate it has a new companion on the little green, a graceful cross to the Irton men who died for peace. The Historic England List Entry Number is: 1012642. Fraser, Maxwell, Companion into Lakeland, Methuen & Co. Ltd., London, 1939. Harbison, Robert, The Shell Guide to English Parish Churches, André Deutsch Limited, London, 1993. Mee, Arthur, The King’s England — Arthur Mee’s Lake Counties — Cumberland And Westmorland, Hodder And Stoughton Limited, London, 1961. The AA, The Illustrated Road Book Of England & Wales, The Automobile Association, London, 1961. Categories: Ancient Crosses | Tags: Irton High Cross in Eskdale Cumbria | Permalink.